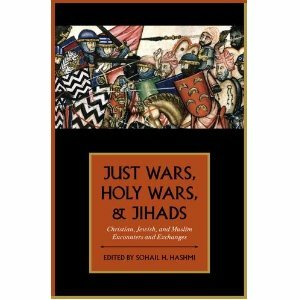 Here is a very interesting collection of essays on religious perspectives on military engagements of various kinds: Just Wars, Holy Wars, & Jihads: Christian, Jewish, and Muslim Encounters and Exchanges (OUP 2012), edited by Sohail H. Hashmi (Mount Holyoke). The publisher’s description follows. 1. What historical evidence exists that Christian and Jewish writers on just war and holy war and Muslim writers on jihad knew of the other tradition? 2. What is the evidence in treatises, chronicles, speeches, ballads, and other historical records, or in practice, that either tradition influenced the other? The book surveys the period from the rise of Islam in the early seventh century to the present day. Part One surveys the impact of the early Islamic conquests upon Byzantine, Syriac, and Muslim thinking on justified war. Part Two probes developments during the Crusades. Part Three focuses on the early modern period in Europe and the Ottoman Empire, followed by analysis of the era of European imperialism in Part Four. Part Five brings the discussion into the present period, with chapters analyzing the impact of international law and terrorism on conceptions of just war and jihad.